Breakfast - Try to eat breakfast within an hour of your waking up, as this will mitigate the hunger from not eating overnight. If you wait more than an hour, you are more likely to overeat during breakfast, taking on excess calories with little improvement in nutrition. 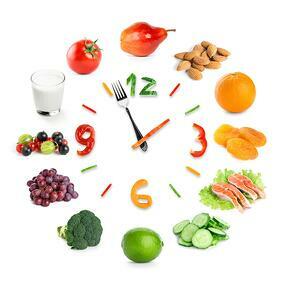 Mid morning Snack - In the typical human body, blood sugar levels drop after 3 hours, making you feel hungry. Eating a small snack at this point will keep hunger under control. Try grabbing a Quest Bar to ensure that you get protein with your snack. As with eating breakfast early, a mid morning snack will prevent you from overeating at later meals. Lunch - A few hours after your snack, sit down for a full lunch. Green vegetables, whole grains, and protein should play a key role in this meal. Keep in mind that fruits turn into carbs and sugar, so try not to eat them any later than this meal. Lunches are typically short, and they can be especially rushed if you decide to eat out, which can lead to choosing something quick rather than healthy. Eating healthy lunches becomes much easier if you try out the Jax Nutrition Meal Plan Program. Afternoon Snack - Three hours after lunch, eat a small snack similar to the one you ate in the morning. Supper - Wait another two hours or so before you eat supper. Your meal should consist of lean meats or other low-fat sources of protein, as well as plenty of vegetables, particularly green ones. Colored vegetables like corn and carrots get their color because of sugars, so try not to eat them this late in the day. Before bed - Be sure to have casein protein in any of its various forms—cottage cheese, egg whites, or a shake with Intek Casein Protein. It’s a slow release protein that will keep your metabolism running through the night. Additionally, be sure to plan your meals around your workout schedule. As a general rule, if you work out in the morning, you shouldn’t consume carbs or sugars during the last 8 hours that you are awake. If you work out in the evening, you can eat carbs and sugars up until you work out and then avoid them for the rest of the evening afterwards so they don’t store as fat. Timing your meals may seem difficult at first, but the longer you do it, the easier it becomes to stick to a regular schedule. This will lay a strong foundation for sustainable weight loss and muscle gains. Jax Nutrition is committed to helping all of our customers achieve their fitness goals. For more information on losing weight, building muscle, and improving nutrition in your diet, visit our website today.